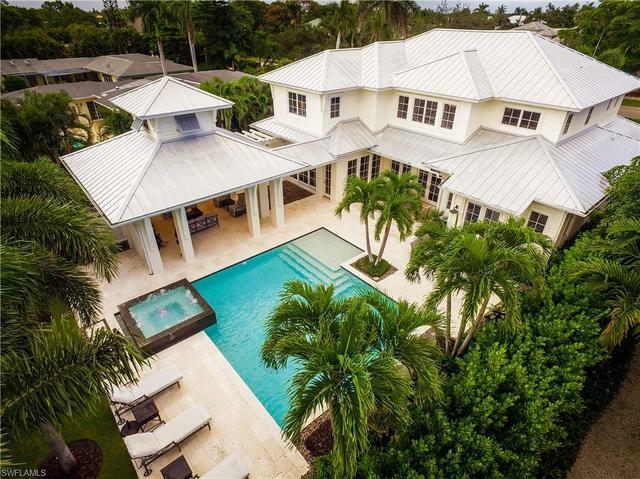 Sitting on one of Naples’ most enviable streets, 2075 Crayton Road in the exclusive Moorings neighborhood has just been listed. The four-bedroom plus den, six-bath (four full, two half), 4,190 square foot (under air) two-story single family home sits on a spacious interior lot with beautiful southwestern exposure and is just a short walk from the beach.The open-concept home remains like new and comes fully furnished. With a full chef’s kitchen, expansive island, gourmet Wolf and Subzero appliances, crisp all white custom cabinetry, any size party is effortless. The exquisite finishes and highest quality architectural and construction detail make this home ‘one of one.’ Wide-plank wood flooring throughout is complemented with occasional uses of marble and terrazzo, while spectacular overhead fixtures bathe the home in light. Meanwhile, the outdoor living area features a kitchen with island, fireplace and television just off the pool and spa (which also has a sun shelf and water feature). The home also features a large three-car garage and lush landscaping that makes you feel as though you are in a private tropical oasis. I was searching for a Property and found this listing (MLS® #218064148). Please send me more information regarding 2075 Crayton Rd, NAPLES, FL, 34102. Thank you! I'd like to request a showing of 2075 Crayton Rd, NAPLES, FL, 34102 (MLS® #218064148). Thank you!